The first Fast & Furious spin-off movie, Hobbs & Shaw, releases in cinemas this August, where we’ll get to see Dwayne ‘The Rock' Johnson drive a huge ten-wheeled armored truck and possibly the new Jeep Gladiator. But what does The Rock drive in real life, you may ask? Unsurprisingly, the muscular actor has chosen a vehicle that befits his larger-than-life physique and personality and enlisted Texas-based tuner Hennessey Performance to create his new ride. Photos posted on Hennessey’s Facebook page show the actor's new modified VelociRaptor V8 pickup truck finished in bright blue being delivered. The Rock hasn’t shared any photos of him posing with his new ride yet, but Hennessey told the Fast & Furious actor to "enjoy your new baller wagon." If you need a refresher, Hennessey ditches Ford’s EcoBoost V6 and swaps it with a custom-built Ford 5.0-liter V8 engine tuned to deliver 758 horsepower via the company’s 2.9-liter supercharger system, which produces seven psi of boost pressure. Other Ford-sourced parts include a 10-speed automatic transmission, wiring harness and ECUs. These modifications enable Hennessey’s V8-powered Raptor to rocket from 0-62 mph in just 4.1 seconds and do the quarter mile in a blistering 12.2 seconds at 115 mph. 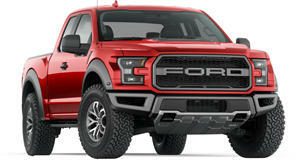 Each VelociRaptor V8 conversion costs $147,950, including the F-150 Raptor donor vehicle. The Rock certainly seems to have a lot of love for Ford trucks. Last year, the professional wrestler and action movie star gifted a modified F-150 to his long-time stunt double, Tanoai Reed, who is also his cousin. He also drove the Ford Bronco concept in the Rampage movie last year and served as Ford’s brand ambassador in numerous ad campaigns back in 2017 to promote the brand.